Please click on the links below to explore the sections of the Cuddly Critters Online Store! Meet the Cuddly Critters artist, storyboard artist / illustrator Tim Holtrop! 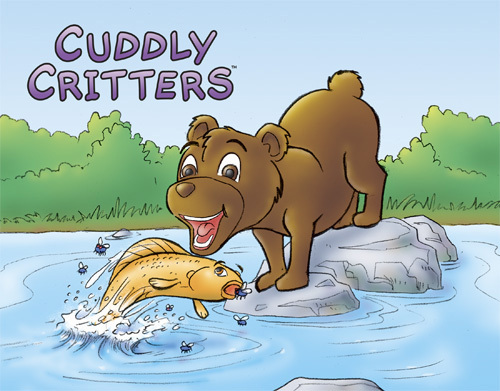 Check out some of the Cuddly Critters on free printable activities at www.cybercrayon.net ! Welcome to the wonderful world of the Cuddly Critters! Across the meadow and through the woods, beyond the mountains, but before the sea, lies the community of “Critter Corners”, abode of many Cuddly Critters! Cute cartoon birds, bears, dogs, cats, squirrels, rabbits and other amazing animals make their homes in this wonderful place! Whether together or by themselves, working, adventuring, or just hanging around at home, these critters really enjoy all that they do! THE CUDDLY CRITTERS ONLINE STORE! Now you can share in their experiences, too! We’re selling a variety of products with unique Cuddly Critters cute cartoon animal graphics on them! Please check out the merchandise we have to offer in our online store! These cute cartoon animals adorn a variety of gift & collectable items, including apparel, mugs, posters, greeting cards, and much more! You can find our goods displayed by character, theme, and product type. Please browse the products we've made available for them...collect your favorite characters, or collect them all! We hope you enjoy your shopping experience there! Tim Holtrop is a participant in the Amazon Services LLC Associates Program, an affiliate advertising program designed to provide a means for sites to earn advertising fees by advertising and linking to amazon.com, endless.com, amazonsupply.com, or myhabit.com.